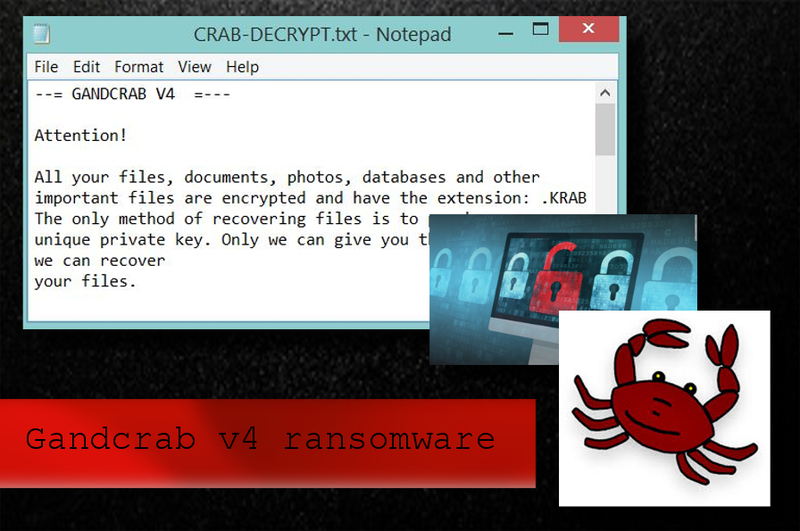 While security experts were convinced that Gandcrab ransomware is done with infecting users worldwide, they discovered the fourth its version in July 2018. The malicious program uses an AES encryption algorithm to lock up files and adds the .KRAB extension to each of it. Once files are affected, a copy of a ransom note appears in each of folders. The text message is named CRAB-DECRYPT.txt or KRAB-DECRYPT.txt and provides certain information which lets the victim notice about the computer infection and files’ encryption. Due to that, they are required to pay a certain ransom (the price can differ each time) in bitcoin to get a decryption key for their files. Install an antivirus in order to increase your computer system protection. It will regularly scan the system for cyber threats. If you carefully follow these steps, you will be able to stay safe from the GrandCran v4 ransomware. Deleting Gandcrab from the system is a must as keeping such viruses can cause the loss of all your files. The longer it stays in the system, the bigger the damage can be. If you deal with this cyber threat more quickly, you might be able to restore your files to their previous versions with less effort. At the moment, it seems that Gandcrab 4 is not deleting Shadow Volume copies of files, so ShadowExplorer can become really helpful while trying to decrypt encrypted files.